Though the Boyd Group and subsidiary Gerber Collision have emphasized insurer direct repair program revenue in their business, Boyd CEO Brock Bulbuck said this month the company plans to increase its penetration of OEM certifications. The Boyd Group began an initiative in 2017 to increase OEM certification penetration and continued the effort this year, according to Bulbuck. “We are on track with that initiative,” Bulbuck said. Gerber’s parent company the Boyd Group represents the only publicly traded member of the Big 4 consolidators, and its financial filings and earnings call provide perspective into that segment of the market. Most of Boyd’s income comes from its U.S. operations, and much of the discussion on the earnings call appears to involve Gerber. Bulbuck explained to analysts that most of the automakers are qualifying certain repairers to fix their vehicles, but he said the majority of the influence on where vehicles are repaired still lies with insurers. However, insurers will likely have to consider a shop’s qualifications, including certification status, when referring business in the future, according to Bulbuck. “It is a growing trend,” he said. Asked by an analyst about the penetration of OEM-certified shops, Bulbuck declined to reveal it. Bulbuck said the company’s plans to spend 1.6-1.8 percent of sales this year on capital items like shop equipment included buying items necessary for OEM certification. In the third quarter, it spent 1.8 percent of sales, or $8.5 million CAD. 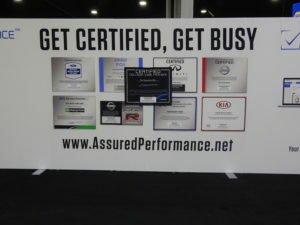 Accelerating OEM certification through spending “might be a way” to gain a competitive advantage, Bulbuck mused, but he noted the company still be limited by the time needed for training, the certification process and onboarding. And training took technicians away from processing actual work, he said. The rise of General Motors and Subaru certification programs this year means virtually all of the nation’s mass-market automakers can market — even through the vehicle itself — their own networks of qualified dealer and independent shops to consumers. (Toyota is the only anomaly, as its network’s focus on dealerships — few of which possess collision capabilities — limits the availability of certification to consumers.) It’s a trend that collision repairers can’t ignore, particularly if OEMs achieve better collision assistance subscription penetration or just extend the period the service is complimentary. As an OEM’s definition of a qualified shop and a good repair might conflict with an insurer’s, collision repairers might find themselves unable to straddle both networks if one or the other master refuses to bend. So it’s interesting to hear Bulbuck’s hypothesis that insurers would adapt to promote OEM-certified shops.